To give your WordPress website a professional look you must have a good-looking landing page.Here is the 5 Best WordPress landing page plugin and themes that is awesome for any marketing website.This best designed and so good-looking landing pages list encourage you to choose a landing page for your website.I always recommend every website owner which don’t have a landing page in their website because landing page have unique benefits in the website.So let’s get in the deep of landing pages for a WordPress website.The landing page load faster if you have cloud hosting.There is many best cloud storage provider in the market that speed up your website.Is this new name for you then know more about this from Wikipedia cloud article. When i have move my blog to WordPress i try to get a good-looking theme that has a slideshow , best-designed CSS for images and menu and also i have design front page myself.But all these things worthless that have no meaning until people don’t know about you.They come to your blog by searching any query on google if they get beneficial content then they read and go back.If you have some intro slides in the website or have a header unique lines or about you and your blog then people make a mind setup to know more about you or your blog.If you are going to set up your WordPress website first time then you must follow few SEO guidelines for WordPress website. Optimize press is only for marketers.Optimizepress marketplace have a lot of landing pages and themes for WordPress website.There free and premium landing pages available.As there is lot of quantity so you can select easy from there. Here is some landing pages from optimizepress. Optimizepress gives you a full WordPress theme management platform that includes Template,landing page, affiliate management etc…Here you easily edit your pages by drag drop editor. There is lot of template designers with amazing designs of landing pages.Optimizepress gives you free to optimize your WordPress website and a make a good-looking website with attractive designs. Now here is you get another best landing page builder that have same features as in optimize press and give you much more themes.I recommend to use this because of it’s price.The price of WP profit builder is low then optimizepress.Here is WP profit builder features at a glance. Pre-designed pages available for blogs,sales,shopping sites,social marketing websites. Here you get templates for shopping sites with featured product on front page.You can engage your visitors by email subscriber form.Designs of the WP profit are much different and so much good looking.Here is some template from wp profit builder. 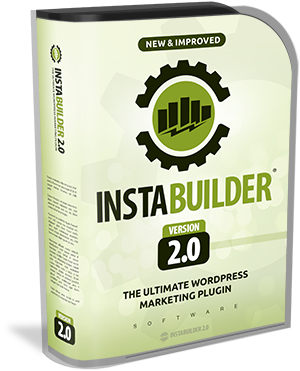 Let’s get one another great wordpress landing page builder.If you see instabuilder is easy to built.By this you can built your landing page in just few minutes.From above two landing page builder this is easy to build.because of its pre-built design area. Very best plugin and themes. Thanks for sharing. In deed this was a great post and informative. Some times landing pages may adverse affect, as some people may not sign up and leaves the page immediately. How do we deal in this scenario.